Create your own Kyocera Mita C2230 color toner pack / bundle with our flexible quantity discount pricing. Mix and match products so you are only purchasing what you need, but also maximizing your savings. Compatible Cyan Toner Cartridge with 11,500 page yield. Equivalent to Kyocera Mita part number: TK-622C. Fits the following model(s): Kyocera Mita C2230. Compatible Magenta Toner Cartridge with 11,500 page yield. Equivalent to Kyocera Mita part number: TK-622M. Fits the following model(s): Kyocera Mita C2230. Compatible Yellow Toner Cartridge with 11,500 page yield. Equivalent to Kyocera Mita part number: TK-622Y. Fits the following model(s): Kyocera Mita C2230. Compatible Black Toner Cartridge with 11,500 page yield. Equivalent to Kyocera Mita part number: TK-622K. Fits the following model(s): Kyocera Mita C2230. Buy our high quality compatible toner for Kyocera Mita C2230 with confidence. Join thousands of happy customers who have found our compatible products are equivalent in page yield and print quality. For our compatible products, we offer a 100% Satisfaction Guarantee allowing you to return products within 6 months if you are unsatisfied. The Kyocera-Mita C2230 is a color laser copier that has a robust feature set to handle large copy and print volumes for the workplace, as well as fast rates that can provides users with up to 35 pages per minute for text projects and 22 pages per minute for graphics. A large monthly duty cycle of 100,000 pages enables it to handle large volumes as well. The unit has upgradable memory with a standard of 256 MB and maximum of 512 MB. It also provides options for network printing that will allow users to print tasks from any connected computer. The machine also includes a scanner, which has scan-to-email and scan-to-mailbox functionality for added convenience, and a fax function for sending and receiving faxes. The unit's print feature can produce a precise resolution of 600x1800 dpi using black Kyocera-Mita C2230 printer toner. The copier can create duplicates with a maximum resolution of 600x600 dpi. An assortment of media-handling options are available, such as a 250-sheet multipurpose tray, 500-page universal bin, and 150-sheet bypass. 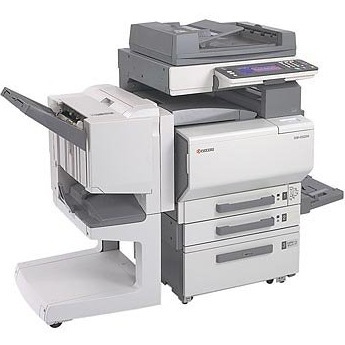 A 100-sheet automatic duplexer allows for quick double-sided copying and scanning. It also includes optional finishing modules like a 1,000-sheet booklet finisher and single position staple finisher. The machine operates with 4 individual Kyocera-Mita C2230 toner cartridges that can be replaced separately as they expire, keeping waste to a minimum. Its replacement toners have high yields for both the color and black supplies, printing up to 11,500 pages each. An easy way users can save money is by purchasing remanufactured compatible Kyocera-Mita C2230 toner cartridges at a lower price than OEM versions. The C2230 is a very capable large-volume office copier and printer that has the high-capacity supplies, quick print and copy rates, and professional-quality results users need. An expandable memory and wide variety of media handling options will even allow this multifunction laser printer to help users expand their output in the future.